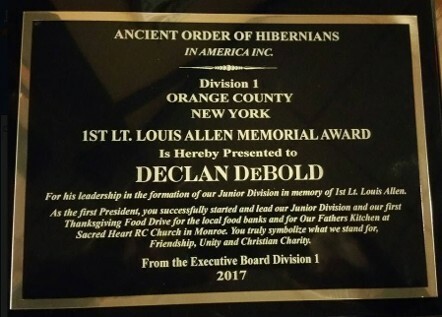 Orange County AOH President Edmund Burke presenting newly installed AOH Division 1 president Billy Coffey with the AOH National Charter for The Lt. Louis E Allen Memorial Junior Division. 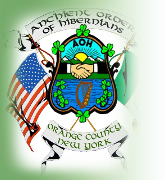 Accompanied by NYS AOH Director Kevin Moore who picked up the charter and had it beautifully framed. 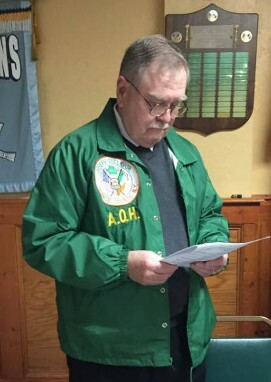 The Joseph Duelk, Jr., Division 1 (Orange County) Monroe, New York held an organizational meeting, of the “First Lt. Louis Allen - Junior Division 1 of Orange County” on January 21, 2017. Eighteen boys signed the application to form the Junior Division. 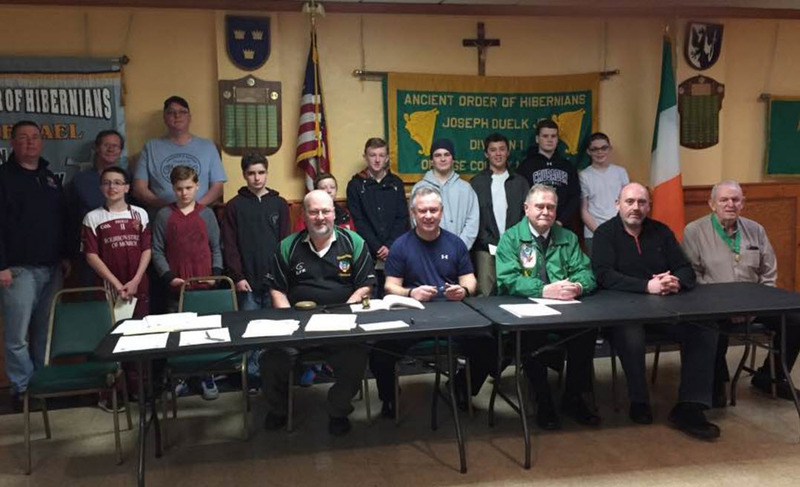 Pictured in the photo (in no order) are some of the newly installed members of the Junior Division, Declan DeBold, Anthony Melo, Liam Ronayne, Timothy Curtin, Harry Degan, William Coffey, Shane Cronin, Conor Flynn, Luke Cronin and Edward Degan. 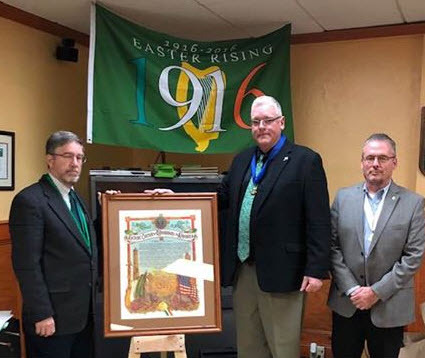 Also present are members of Joseph Duelk Jr. Division 1, (seated L/R), Tom Keahon, President Tommy Flynn, Robert Allen, Rob Ronayne and County Pres Tom McDonald. Standing in back; Chris DeBold, Tim Curtain and John Coffey. Vice President Neil O’Riordan (not pictured) will advise and guide the new members. In attendance was Vivian and Robert Allen the parents of Lt. Louis Allen. 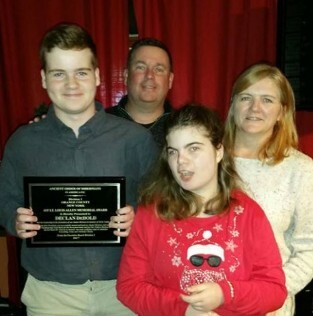 The father of Lt. Louis Allen had the honor of initiating the new members.